I was very pleased to be invited to the launch party for Woodsford Tradebridge which was held last night, on the iconic London Eye. A superb venue for such an event. 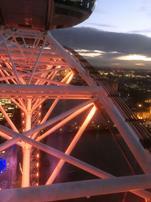 The event took place during 2 rotations of the eye and guest took in some amazing views across the city of London whilst champagne and canapes were serves during the "flight". Woodsford Tradebridge is a new trade finance and invoice finance company that have just launched, as a new venture within the established Woodsford group. The event was held on the London Eye and was attended by various brokers and Introducers from around our industry, with Woodsfords getting confirmation of a deal having gone live just as we boarded the pod! It was good to catch up with some of the key introducers across the industry. Woodsford have an interesting approach, connecting invoice finance to trade finance such that the IF repays the advance from the TF, significantly extending the time for which the client enjoys credit in respect of their imports. The TF can even be repaid using asset finance, if the import is suitable equiment of machinery to support the asset finance. Woodsford are also able to offer standalone trade finance facilities if required, they typically handle transactions where funds in use exceed £100K. This type of arrangement can work well if you have orders for the product being imported, however they can also finance in cases where the client wants to buy for stock, rather than to confirmed orders. The prime movers in the new venture are well know, experienced individuals, that previously worked for other trade and invoice finance companies within our sector. If you are looking to finance an import you can REQUEST A CALL BACK from Matt Speed at Woodsford Tradebridge, to discuss your requirements using our direct contact system.